So here’s the deal. At Hyundai, N stands for Nurburgring. That fabled German racecourse is where the automaker spends lots of time tinkering with performance-tuned models, the first of which to land in showrooms is the 2019 Veloster N.
Naturally then, if you’re Hyundai and you’re trying to build a new performance sub-brand, you bring out a new N Line nameplate to apply to your sport-tuned models that don’t check all of the boxes for inclusion in the official N club. They have, according to Hyundai, “sporty design elements and refined powertrain and chassis upgrades” compared to the vehicles on which they are based. With that as background, you can better understand the 2019 Hyundai Elantra GT N Line that the company debuted at the 2019 North American International Auto Show in Detroit. Replacing last year’s remarkably appealing Elantra GT Sport, the Elantra GT N Line gets visual upgrades lifted from Europe’s i30 N model. The changes include a new grille, lower front spoiler, black side mirror caps with integrated turn signal indicators, and a revised rear bumper. New 18-inch wheels debut, and with the manual gearbox they have standard Michelin Pilot Sport summer performance tires. N Line badges signal that this version of the Elantra GT is not to be trifled with. Inside, various N Line identifiers and red accents and stitching set this Elantra GT apart. Sport seats are heated and wrapped in leather, and they feature thigh bolster extensions. Metallic accents decorate the steering wheel and gearshift knob, and the Elantra GT N Line has sportier instrumentation. As part of an option package, the Elantra GT N Line is available with a power driver’s seat, ventilated front seats, an auto-dimming rearview mirror with a Homelink universal garage door opener, and a panoramic sunroof. Hyundai carries over the Elantra GT Sport’s turbocharged 1.6-liter 4-cylinder engine, which makes 201 horsepower and 195 lb.-ft. of torque. A 6-speed manual gearbox is standard, with a 7-speed dual-clutch automatic with paddle shifters available as an option. Beyond the drivetrain, however, Hyundai makes several changes to the Elantra GT N Line. New steering and suspension tuning aims to enhance the driving dynamics, and the summer tires are new. 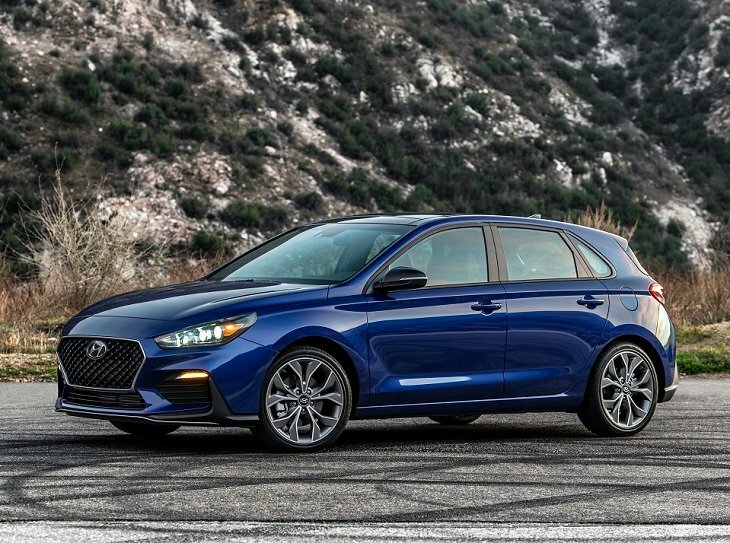 Named a “Top Safety Pick” for 2019 by the Insurance Institute for Highway Safety (IIHS), the Elantra GT is a safe 5-door hatchback. To help ensure that a collision doesn’t occur in the first place, Hyundai offers its SmartSense driver assistance and collision avoidance technology including adaptive cruise control with stop-and-go capability, forward collision warning with automatic emergency braking, lane departure warning with lane keeping assist, a driver attention warning system, and high-beam assist. SmartSense is part of the optional Technology Package that also upgrades the car’s infotainment system with an 8-inch touchscreen display, a faster processor, Blue Link connected services, navigation with Here HD Traffic, and a wireless charging pad. The Technology Package also includes a 7-speaker Infinity premium sound system.